‘GINGER is a lifestyle company that has operated out of Thailand for seventeen years. The Danish Hans B. Christensen is the designer and owner of GINGER, which aims to inspire people to transform the ordinary into the extraordinary. 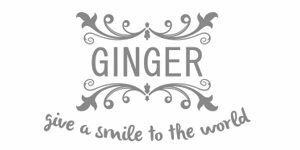 The GINGER slogan is: live joyfully, colourfully, and give a smile to the world,’ says Jurgen ter Haar. ‘Colourful, original, quirky, and bold designs are an inherent part of the GINGER brand. Our products are safe and fun to use, and hand-made with care, craftsmanship, and love.’ The GINGER collection consists of high-quality melamine tableware and cheerful lifestyle products for indoor and outdoor use. What does GINGER’s production process look like? Jurgen, Lineke, and their daughters visited the studio and the factory in Thailand where the GINGER products are made. There, they met the employees who manufacture the products with passion, care, and craftsmanship. GINGER is committed to fair production practices and manages these in-house; only the melamine tableware is produced in a large melamine factory. Melamine is a high-quality plastic. All melamine products manufactured by GINGER are made from 100% melamine to guarantee the highest possible quality. A lot of melamine products currently on the market are made from a combination of components, thereby reducing their quality. ‘Thanks to the 100% melamine sticker on our products, you know you’re getting the highest possible quality. Melamine is BPA-free, dishwasher safe, suitable for food and drinks, and suitable for liquids up to 70 ºC. Melamine is fun and convenient for everyday use; it’s lightweight, shatter-proof, and has the added advantage of keeping your food warm longer thanks to the slow heat transfer!’ says Lineke. Jurgen and Lineke’s enthusiasm and passion for the GINGER brand is reflected in the cheerful collection. All the more reason to stop by GINGER Lifestyle at Trends & Trade!